It's been more than 50 years since Jane Goodall first stepped foot in dense jungles of Tanzania's Gombe National Park to begin her groundbreaking studies on the behavior and social structure of the chimpanzees that live there. Goodall's work in Gombe has been instrumental in bridging the divide between humans and these, our closest primate cousins - but up until recently, it was only a fortunate few who would get the chance to see chimps in the wild. For Google's latest Street View "trek," the company has teamed up with the Jane Goodall Institute to capture some stunning images of the region, and its inhabitants, which have been the focus of Goodall's lifelong research. "Through my time at Gombe and the years that followed, I learned first-hand how important it is for each of us to understand the world we share. Because only when we truly understand will we begin to care, and only when we truly care will we take action. This is how change happens. This is how we will make the changes we need to live in balance and harmony on this planet we all call home." 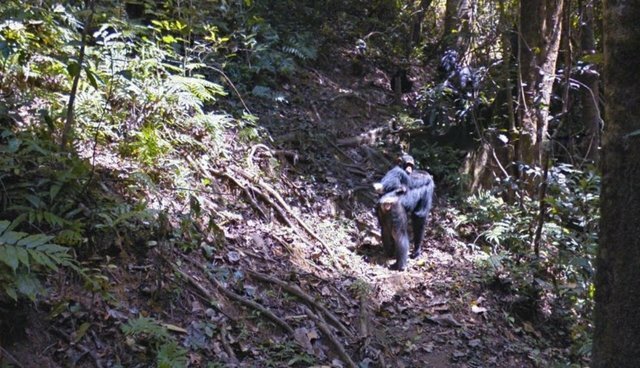 Here's one of the many chimpanzee encounters captured on Street View. Click here for more. Learn more about Google's partnership with the Jane Goodall Institute by visiting the project's website.